For Greg Buzek, president of Franklin, Tennessee-based research firm IHL Group, ADA compliance makes good business sense for kiosk operators. Kiosk integrators have a constant responsibility to stay on top of ADA requirements and give the best guidance they can to their retail and other types of clients, Bowers stressed. “Frank Mayer’s director of technology is responsible for our ADA approvals, and he has to go through a constant update process,” he said. Kiosks should be designed minimally to allow a consumer in a wheelchair to come up to the kiosk and access all interaction and input devices, touchscreens and keypads comfortably straight-on or sideways from their wheelchair, Bowers said. “The kiosk’s height, reach and ease of input must be designed with the ADA consumer’s best input in mind,” he said. 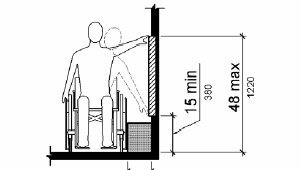 What is the maximum height or “touch point” for the user interaction? What is the overall height and reach of each component presented for user access? Does the mounting of the kiosk present any obstruction? If so, this should be taken into consideration. ADA specifies that the forward or side height and reach of a kiosk or ATM should be between 15 inches and 48 inches from the ground, unless there is an obstruction, in which case the side reach is reduced to 46 inches and forward reach to 44 inches. “Kiosk deployers should consider alternative pointing devices or interaction methods for operable parts outside these guidelines,” said Dusty Lutz, general manager of NCR’s Retail Self-service Solutions Group. A kiosk’s payment device must meets the ADA guidelines for numeric keys such as an ascending or descending 12-key layout, a raised dot on 5, and function keys that stand out visually from the background surface. The display screens need to be visible from a point located 40 inches above the clear floor space, and characters displayed on the screen must be at least 3/16 inch high with sufficient contrast. For instance, “people who have vision impairment can be helped by adding an EZ Access device to a kiosk along with changes to software to allow for easier navigation,” Olea said. Developed by the Trace Center at the University of Wisconsin-Madison, EZ Access is a set of interface enhancements that can be implemented in the design of almost any electronic product to make it usable by people with disabilities. “Hearing impairment can be aided by providing a headphone jack on the kiosk, allowing users to change the volume, or offering visual cues or messages along with audio tones and messages,” Olea said. Section 508 of the U.S. Government’s Rehabilitation Act has requirements for federal government kiosks, digital signage, websites and other IT systems to meet the needs of visually- and hearing-impaired people. “It requires government agencies to provide individuals with disabilities with access to electronic and information technology and data comparable to those who don’t have disabilities,” Bowers said. Section 508’s requirements go beyond those specified in ADA, but Bowers said retail kiosk operators should strive to meet them. Ergonomics and thoughtful placement of peripherals can make a significant difference, according to Olea. On Olea’s Automated Passport Kiosk, an EZ Access device from Storm Interface was placed within ADA-compliant height and just to the right of the monitor. “This allows for easy use while standing, and is still low enough that, if someone in a wheelchair needed to use the kiosk, they could do so as well,” Olea said.